We specialize in both Foreign & Domestic vehicles and provide all the necessary manufacturer specified services. 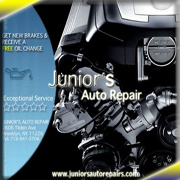 We keep your car running like new at a significant discount compared to the dealer. We have Factory Diagnostic Tools for European vehicles. Certified New York State Inspection Station. We are your one stop service center for all your automotive needs whether it’s just for an oil change or a transmission replacement. 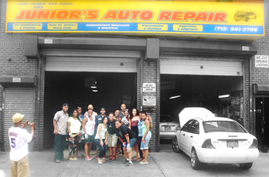 Featured on Brooklyn News 12, for the Womens Car Care Workshop. Presented by ELEROSEYEA and Junior's Auto Repairs. 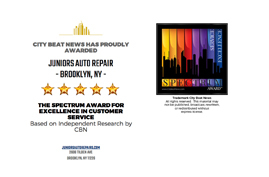 City Beat has prodly awarded the Spectrum Award for excellence in customer service. 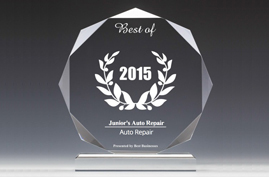 Best Businesses of Brooklyn Award in the Auto Repair category by the Best Businesses of Brooklyn Award Program. Experience The Exceptional, Maintain Your Car.